If you want to add some extra style to the entrance of your home and add greater security and better energy efficiency, you should consider a composite door. We supply and fit high-quality composite doors from UK company XtremeDoor who specialise in high performance composite doors you can trust. 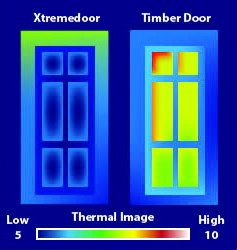 XtremeDoor offer a high level of security, thermal insulation, weatherproofing and peace of mind. Nothing is more important than the security of your home: our composite doors ensure your safety is first in mind, every time. Keep intruders at bay with security features such as a five-point locking system and an anti-snap, bump and drill cylinder designed to withstand the three main attack methods during a burglary. 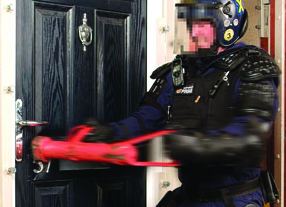 All doors also feature 'Secured by Design' - a police initiative put in place to reduce burglary and crime by designing out crime through physical security and processes. 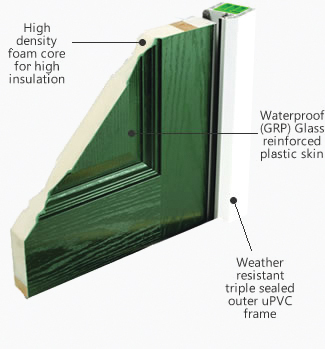 Upgrading your front door to something more thermally efficient is an easy way to cut down on your energy consumption. Use less energy and still enjoy a warm home by replacing your front door with an XtremeDoor. The doors that we fit will keep in six times the heat of a wooden door using a combination of a high insulating foam core and PVCu edge banding. Our doors are incredibly thermally efficient, keeping your home warm and you relaxed in a warmer, more comfortable environment. Upgrading your front door to something more thermally efficient is an easy way to make your home warmer and help cut down on your energy consumption. XtremeDoors are better at insulating than timber - six times better than timber, in fact - so you can relax in a warmer, more comfortable environment. Use less energy and still enjoy a warm home by replacing your front door with an XtremeDoor. A combination of a high insulating foam core and PVCu edgebanding makes XtremeDoor incredibly thermally efficient, keeping your home warmer when it's colder. For more information about XtremeDoor and to see the range of colours and styles please visit their website - www.xtremedoor.co.uk, download their brochure here or contact us at SH Windows and we will happily go through your options.